Today’s couples are marrying with unique modern charm. For today’s weddings, really anything goes… but lately a lot of brides and grooms are opting for traditional with a twist. The more unique and creative, the better, and it’s not just about being over-the-top or sparing no expense. It’s much more about spending time and thought on the fine details, and all these little things add up to an extraordinary and even more memorable occasion for not just the bride and groom, but every guest in attendance. In a quick visit with Ashley Farthing of Farthing Events and event specialist, Lauren Wagner, at their cheerfully designed office inside the Philtower, I was not only blown away by the unique elegance of their work in photos, but also the creativity and customizing that goes on for each client. Their energy and ideas are nothing short of amazing while they manage to keep a relaxed, low-key feel to things. It’s easy to see how they’ve surely put many brides-to-be at ease with their experience and sweet, calming demeanors. This team gives new meaning to thinking outside the box. “How do I engage all five senses in a design?” Farthing asks herself at each project’s start, and creatively finds ways to weave a common thread through all aspects of the plans. The first sight of the invitation, the smell of the flowers and food, the sound of a quartet playing live music, the feel of the linens, the taste of the cocktails… each plays a great role in the overall experience. “We like to make sure guests have a drink in their hand within the first 60 seconds,” says Farthing. “It welcomes them and makes them feel catered to. After that, guests can delight in the many details they undoubtedly will notice, and the thoughtful planning that’s been going on for months. 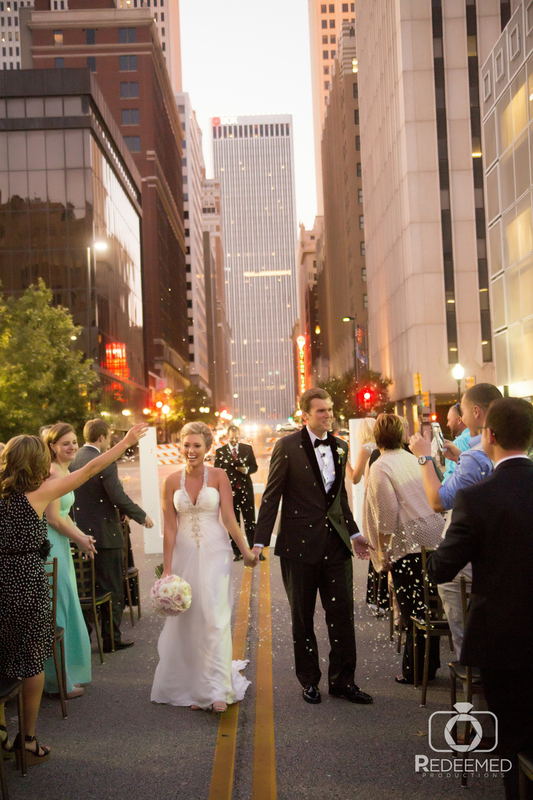 For the venue of one recent wedding, they managed to get the city’s approval to shut down a part of Boston Avenue in the heart of the Deco District in downtown Tulsa – no small task that needed six months advanced planning to secure but the end result was fabulous. 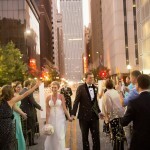 Our city’s extraordinary architecture served as the backdrop with guests seated on each side of the street’s center line, or in this case, the aisle. 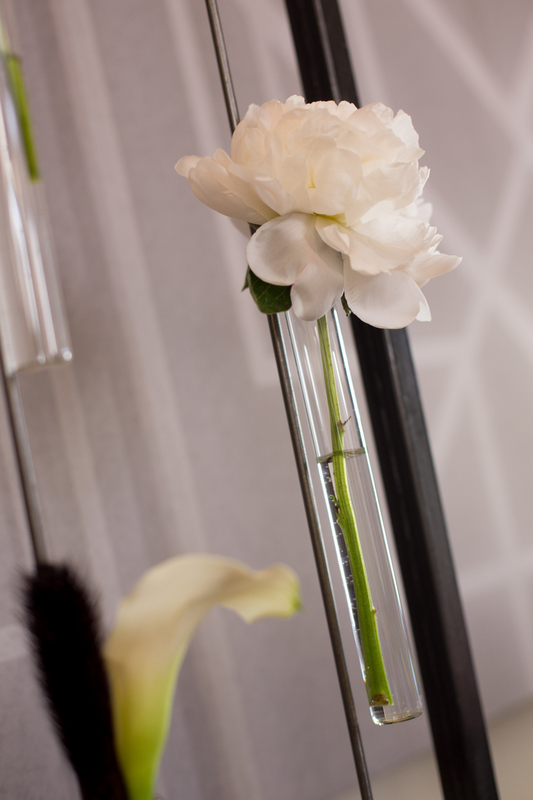 For a recent creative photo shoot, the theme was Art Deco with a modern edge. 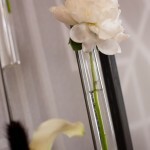 Farthing Events assisted in designing a floral arrangement consisting of simple, single cuttings placed into individual test tubes woven together by copper wire and suspended from the ceiling above the dining table. “Flowers are costly, and there are lots of ways to supplement with décor,” Farthing shares. “The same copper wire was used throughout the handmade tabletop décor including the vases of flowers, candles and abstract art made from clear tubes.” You can even look closely and see copper details atop the wedding cake, and the stir sticks in drinks have the same design as the abstract tabletop art. Another couple requested an updated version of a traditional backyard wedding reception, and it turned out anything but run-of-the-mill. “We built the venue from the ground up,” says Farthing. When guests arrived, the front yard beckoned with a pianist’s music flowing from a grand piano and cocktail tables adorned with linens of glittering gold or white ruffles. 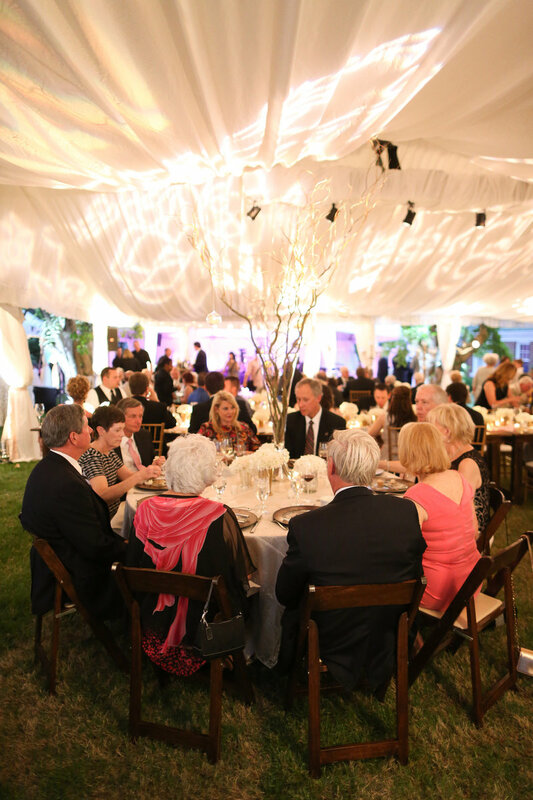 The backyard was virtually a wedding village with numerous tents billowing with white fabric and brilliantly lit by chandeliers, custom lighting projections and dazzling breakup patterns. 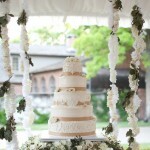 The cake swing inside its own tent is an awe-inspiring sight. 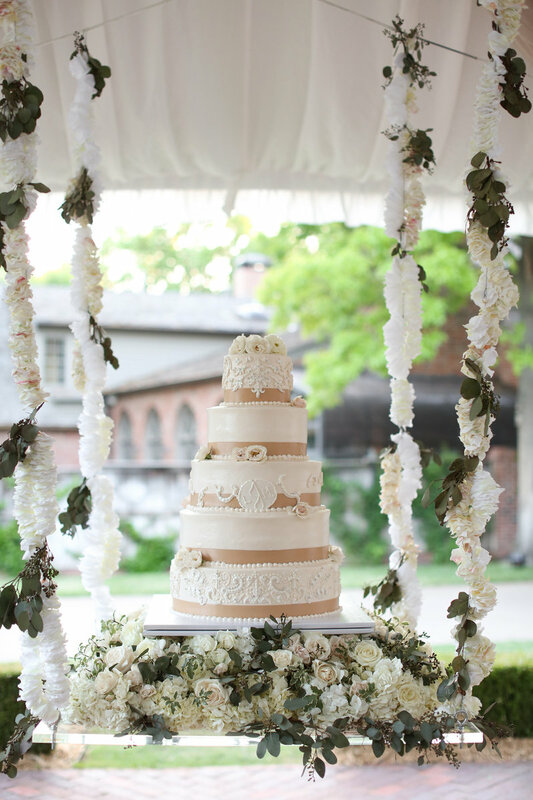 “My dad is an engineer and so a lot of my visions are made into reality with his expertise on how to construct it,” Farthing says of the cake swing, which consists of a piece of Lucite for the base held and wired into the tent supports by cables. The hors d’oeuvres and the groom’s cake are also displayed with this same magnificent effect. Farthing also enjoys catering to the kids at a lot of events, especially weddings. This can include their own separate boys’ and girls’ tables covered with paper tablecloths and containers of crayons, and even their own menus with kid-friendly food to choose from. She’s even enlisted the help of Seeking Sitters, a Tulsa area babysitting service, to help with the entertainment and supervision of all the little ones so everyone can relax and enjoy. “We do a mix of about 60 percent weddings and 40 percent social gatherings, such as galas or fundraisers for nonprofits, bar and bat mitzvahs and milestone birthdays, so we constantly have a great mix of different projects going on,” says Farthing. Farthing Events is a full-service event design and production company, so she works on anything from small intimate events to 1,500-person gatherings. They’re excited to be working on the Patriot Championship for the Folds of Honor organization, which will include a gala of approximately 1,000 guests and the “Freedom Concert,” which has in the past included entertainers like Dierks Bentley, Rascal Flatts and Darius Rucker. 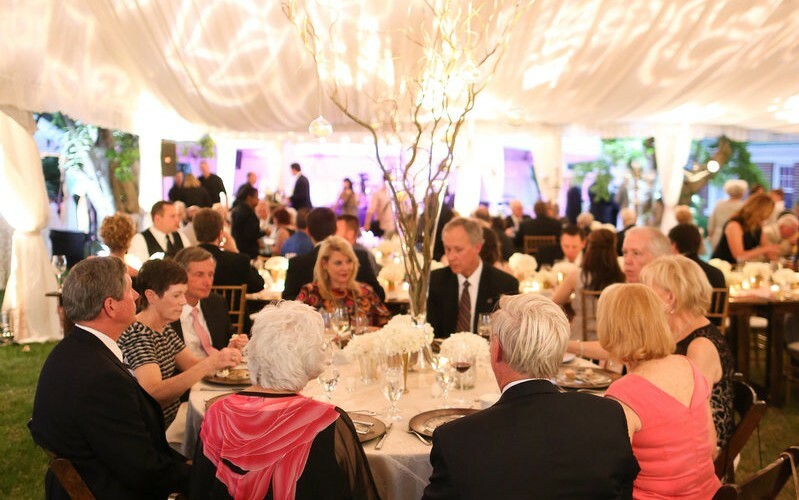 Of course right now is the height of the wedding season so it’s not uncommon for Farthing Events to work extra long hours during the week of an event to start setting up. A typical wedding setup can start about a week in advance beginning with the tent installation, then there’s a trail of deliveries from that point which require constant oversight. On the day of an event, Farthing may start working at 8 a.m. and work through the night until 2 am. “We absolutely love what we do and we focus on that when we’re exhausted,” Farthing says. Being a part of so many special occasions enables her to make a great difference in people’s lives, and the memories she helps to create are treasured keepsakes for everyone. 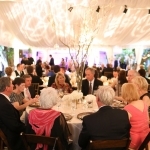 For more information on Farthing Events visit www.FarthingEvents.com. Natalie Nirk is our Home & Fashion Editor and also a registered interior designer with the Oklahoma Board of Architects. www.NatalieNirkInteriors.com.